A 2015 All-America Selections winner, Hestia Hybrid Brussels Sprouts tolerate both warm and cooler weather—and have a very uniform, upright habit. Growing more than 24 in. tall, each plant produces up to 100 flavorful, 1-in. sprouts that are excellent for roasting, sautéing and freezing. For even sweeter, more tender sprouts, harvest after a frost. Brussels sprouts are loaded with nutrition: they contain nearly 150% of the recommended daily allowance of vitamin K and are full of dietary fiber. 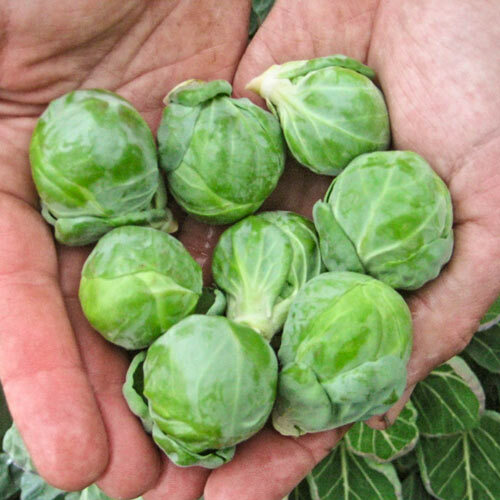 Brussels sprouts seed can be direct sown into the garden between mid-May and June. 100 DAYS. Spacing18-24 inches apart in rows 3 ft apart. FruitBright green exterior and smooth dense yellow interior. 1" in diameter. Seed CountApprox. 30 seeds per packet. CommentsTolerates much cooler temperatures and the flavor improves deliciously when the temperatures dip into the 30's. Tolerates both warm and cold weather. Contain nearly 150% if the RDA of vitamin K. They are full of dietary fiber and they are an effective immune regulator. Excellent flavor. YieldUp to 100 sprouts per plant.